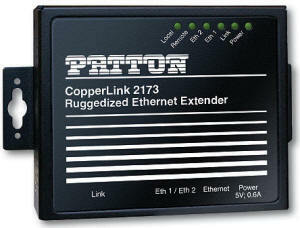 Current production product is the Patton CL1212E Extended Temp Ethernet Extenders. Operates Over Twisted Pair—Reduces the cost and hassles of new installations. Utilizes installed voice-grade twisted pairs to eliminate the expense of fiber or Cat5e cabling. Plug and Play—No configuration or cable hassles during installation with auto-sensing 10/100, full or half duplex, and auto MDI-X Ethernet ports. Full-duplex data-line rate of 155 Mbps—Provides near fiber performance for bandwidth intensive applications. Ruggedized—Operating temperature of -40 to 85°C. Flexible installationWall-mount ready and an optional DIN rail mounting kit is available. 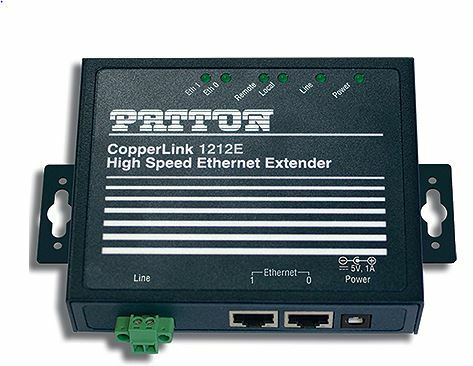 The Patton CopperLink™ 2173R utilizes pre-existing twisted pair infrastructure enabling twisted pair previously used for legacy systems such as TTL, RS232 and 422/485 to be used for extending networks or connecting Ethernet devices together. With a pair of 2173Rs or combined with a desktop-style 2173, twisted pair can carry an extraordinary bandwidth of 155 Mbps full-duplex (upstream plus downstream). Reusing the already existing infrastructure for Ethernet Networking eliminates the cost of purchasing expensive fiber and Cat5E or greater cabling. Most important, it avoids the downtime and hassles that installing cable would cause. The 2173R operates in rugged environments where temperatures range from -40 to 85°C. The 2173R’s sturdy aluminum case can be quickly mounted on a wall or DIN rail (with optional DIN rail kit). 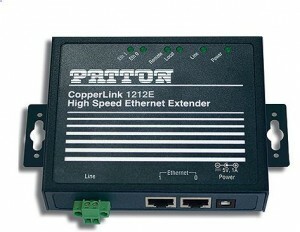 The Model 2173R multi-rate Ethernet Extenders are ideal for delivering Ethernet links to remote buildings that are beyond the 328-foot (100-meter) distance limit of Ethernet. 100 Mbps throughput eliminates bandwidth concerns previously experienced with other copper wired transmission technologies. By utilizing existing voice grade copper pairs the expense and hassle of installing low capacitance or fiber cable is no longer required.